I went searching for a way to make an Ableton style drum rack in Linux and found this awesome idea which of course uses the amazing Reaper! I’ve tested it in Lubuntu 18.10 and works great on the Linux Native version. Drag and drop samples work fine too! This entry was posted in Linux, MIDI and tagged ableton for linux, ableton in linux, ableton linux, ableton live 9 linux, ableton live for linux, ableton live free download for linux, ableton live lite for linux, ableton live on linux, reaper daw, reaper daw download, reaper daw review, reaper daw skins, reaper daw software, reaper daw system requirements, reaper daw tutorial on February 28, 2019 by DemonicSweaters. As you can see it’s pretty amazing. I’m using it on my Amazon fire tablet and it works really well. This entry was posted in MIDI, Technology, Tutorials and tagged music notation android, music notation app android, music notation app for android, music notation apps for android, music notation for android, music notation ipad, music notation ipad app, music notation ipad drums, music notation ipad pro, music notation ipad pro or microsoft surface, music notation software, music notation software chromebook, music notation software comparison, music notation software for android, music notation software for ipad, music notation software free, music notation software free download, music notation software free for mac, music notation software linux, music notation software reviews, music notation software sibelius on February 15, 2019 by DemonicSweaters. This is a project I’ve wanted to do for a long time, and I finally did it and decided to make a youtube vid about it. I took an old Mac SE30 case and built an all in 1 Raspberry Pi DAW computer into it. I really think it came out fantastically well and wanted to share my tips in making one for your self. Thanks for watching and please watch more of my videos! This entry was posted in Linux, MIDI, Vintage Computing and tagged macintosh se/30, macintosh se/30 boot disk, macintosh se/30 emulator, macintosh se/30 error screen, macintosh se/30 expansion, macintosh se/30 operating system, macintosh se/30 repair, macintosh se/30 sad mac 0000000f, macintosh se/30 schematics, macintosh se/30 value, raspberry pi 3, raspberry pi 3 amazon, raspberry pi 3 case, raspberry pi 3 model b, raspberry pi 3 pinout, raspberry pi 3 projects, raspberry pi 3 retropie, raspberry pi 3 software download, raspberry pi 3 specs, raspberry pi 3 windows 10 on April 30, 2018 by DemonicSweaters. This is a new song I created with only the Yamaha FB-01 in 8 part multi-timbral mode and then played lived drums to it. No FX were used on the FB-01. I seqenced the MIDI using the program, Seq24 for linux, then recorded the drums in Harrison Mixbus 4. This entry was posted in drums, Electronic Music, MIDI, Synthesizers and tagged cad kbm412, cad kbm412 bass and kick drum microphone, cad kbm412 gearslutz, cad kbm412 kick drum microphone, cad kbm412 mic, cad kbm412 placement, cad kbm412 review, cad kbm412 reviews, cad kbm412 vs, pearl export snare, pearl export snare drum, pearl export snare drum review, pearl export snare drums, pearl export snare size, pearl export snare stand, slingerland drums, slingerland drums 1963, slingerland drums craigslist, slingerland drums for sale, slingerland drums history, slingerland drums on ebay, slingerland drums serial lookup, yamaha fb-01, yamaha fb-01 editor, yamaha fb-01 factory reset, yamaha fb-01 fm sound generator, yamaha fb-01 manual, yamaha fb-01 owners manual, yamaha fb-01 review, yamaha fb-01 sound editor, yamaha fb-01 synthesizer, yamaha fb-01u on November 13, 2017 by DemonicSweaters. Sysex stands for “system exclusive”, and it is the format that was used by many synths to store the information of the synthesizer. You can store patches, settings and banks using sysex data. If you’ve ever wondered how to transfer sysex patches to your vintage synth using a modern computer, there’s plenty of commercial programs out there that can do this with, but you can also do it for free with a program called MidiOX. In this older YouTube video of mine, I go over the process of doing this with my vintage K1 synth. The same technique can be used with nearly any synth that works with sysex data. 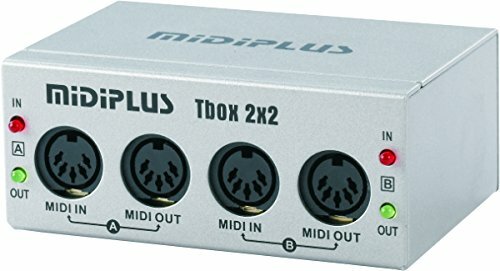 All you need is a windows or linux computer, and a midi interface like this one or something similar and you can create your own library of patches on your computer for your vintage midi synths. What is great about this is you can download thousands of patches online and easily transfer them to your synth achieving maximum fun. This entry was posted in MIDI, Tutorials and tagged DX7 Sysex, free, how to transfer sysex data to a vintage synth, midi data, midi files, Sysex transfer too, vintage synth ads, vintage synth collection, vintage synth explorer, vintage synth for sale, vintage synth lab awm-3 on November 7, 2017 by DemonicSweaters.